On Saturday, the Farmer’s Market springs to life from 10 a.m. to 3 p.m. offering an amazing variety of harvested bounty from local farmers, as well as herbalists, bakers, and other “artisanal food masters.” Among the offerings are fruits, vegetables, grain, breads, meat, honey, and handcrafted herbal creations. Traditional fall cooking demonstrations will be held all weekend at different “harvest inspired” homes. These homes will all represent different areas of North America during different periods dating from the mid-18th to early 20th centuries. Meals will feature foods grown in each area using recipes from the time period, and each will be cooked by costumed homemakers using the same methods, tools and equipment used then. You may see bread baked on an open hearth, watch stews simmer in a coal or wood stove, or learn food preservation techniques from 200 years ago. If all that cooking makes you hungry, don’t forget to stop by the Greenfield Village Store for the Local Roots Product Sampling with different yummy goods to sample each day. While you’re there, pick out some souvenirs and treats for friends and family like the famously irresistible Hobo Bread. For a little more action, head over to live demonstrations at working farms given by authentically-garbed farmers who show how it was done by plowing with steam and horses and threshing grain the old-fashioned way. You can also enjoy a stroll through an apple orchard ripe with heirloom fruit. The highlight of your day will be enjoying authentic American cooking at the Village’s A Taste of History restaurant or the Eagle Tavern. No time to sit down? Get something on the go at the Owl Night Lunch Wagon or the State Street Lunch Stand. For dessert you can choose from Carousel Confections, Frozen Custard or Sir John Bennett Sweet Shop. In addition to the wonderful array of food-related history, take a little time to witness more of the olden times at Liberty Craftworks. There you can find more illustrations of history at the Armington & Sims Machine Shop that’s similar to those that helped build our industrial complex, the 75-year-old Sandwich Glass Shop where skilled glass artists create beautiful glass objects all day, the renovated Pottery Shop where you can see pottery made from start to finish, and the Loranger Gristmill, which was operated by Edward Loranger until he was 91 years old. There is a never-ending supply of history at Greenfield Village. No matter your interests, there is always something for everyone. So if food isn’t your group’s thing, The Henry Ford and Greenfield Village have packages and promotions offering as much as 30 percent in savings. Your group can sign on for the All-Access Package or choose one that combines your favorites, such as the Museum and Factory Combo, the Museum and Village Combo, or the Main Attraction Experience, to name a few. 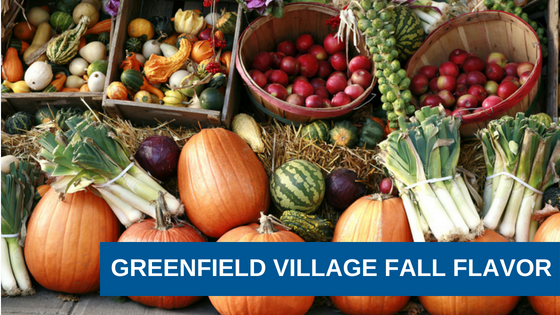 If it’s been a while since you’ve been to Greenfield Village and the The Henry Ford, there’s never been a better time to return. If you need help planning your group tour, download our free publication, “The Complete Guide to Booking a Bus” and find out more about Indian Trails charters!